Enhance the existing beauty of your house with uniquely designed walkways. They serve as both style and function. The choices are almost endless with various design ideas to modify your home’s outdoor area. There are different types of sidewalks available in the market, and what matters most in determining the look of a home’s outdoor is the look of your walkway. Offering a wide selection of stones, material quality, specific weather-resistance options, and more, we understand that the correct implementation plays a significant role in making it more durable and long-lasting. Interlocking paver walkways are a popular choice among most homeowners and business establishments. Quality sidewalks include an array of shapes, colors, patterns, and sizes to match your various preferences. They are great for all seasons and can withstand harsh weather, be it long winters, monsoons, or hot summers. Other common sidewalks are brick, concrete, bluestone, and concrete interlocking pavers. 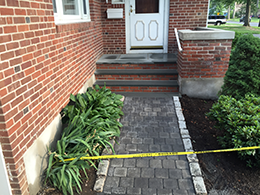 We will handle your project start to finish, from planning it out, excavation or demolition of your old walkways, to installing your new sidewalk to ensuring your satisfaction after the project is complete. Visit our showroom for your new pathway ideas. 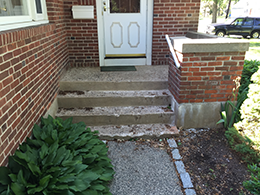 Our qualified and licensed masonry professionals bring the best results in your pathway installation. They have an excellent understanding of the field and know that the area must be prepared properly to ensure lasting results. Your walkway installation ideas can be tailored to your specifications and also made with material to suit particular locations, weather conditions, and budget requirements. No matter what kind of service you need—stepping stone pathway installation, a new patio walkway, a garden path replacement, or something else—our team of professionals will perform their duties reliably and efficiently, so you will be able to enjoy the benefits that these pathways can add to your property. With an A+ rating from the Better Business Bureau, Creative Masonry & Chimney understands how to please our customers. We have years of experience with installing paver walkways, backyard walkways, stone paths, and similar structures, and we are highly confident in our ability to provide you with the level of service you desire.